It was a quite long break in writing (but not in updating the website). After all that happened since my Makalu summit and Inaki's passing away, I was just not in the mood to write down my thoughts. Some time must pass till you start understanding again, till you get the strength to have your eyes open again, to help things get revealed. To see the true meanings of the happenings of your life. It's not about rage, but about understanding. The climb does not change you. It will be a too sudden and maybe dangerous process. I think change is a state when you suddenly jump from point A to point B. With just nothing in between. Only the void. And you have that dumb look on your face screaming " What the hell happened?" . And not many clues to learn from. Change can be so sudden that can have an unstoppable destroying force. The climb instead transforms you. A step by step process, but extremely steadily. We must deal with change making it an interior transformation process. For some things you must just allow yourself enough time to melt inside for making you a better and a stronger person. I think we are as good as our power to envision things and inspire and influence positive transformation around us (to note I didn't say change). 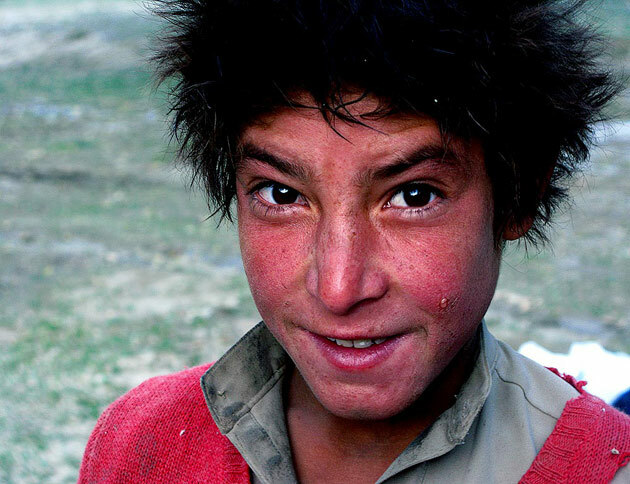 ...well, I'm back in the Karakoram for last year's unfinished business. 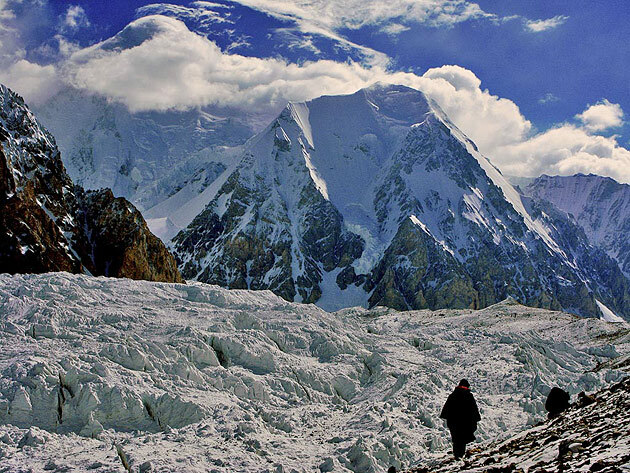 I was here in 2007 to have an attempt to both Gasherbrum 1 (8068m) and Gasherbrum 2 (8035m). 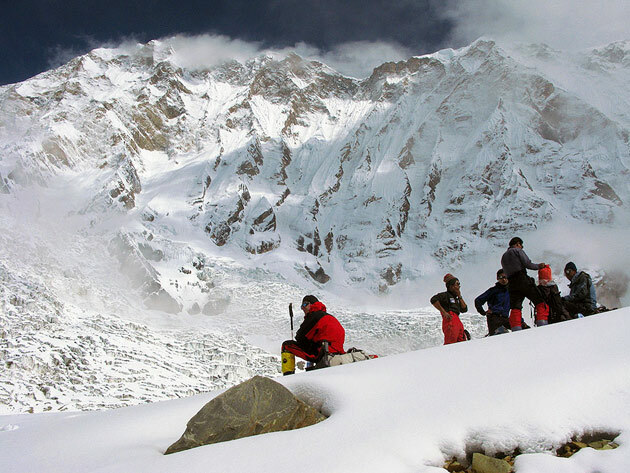 You can have a look at that expedition at http://gasherbrum.cloudclimbing.ro/ It was an infamous season, two German climbers died in an avalanche between Camp 1 and Camp 2 on Gasherbrum 2; one Czech found death on his summit day up on Gasherbrum 1 and another German died while being in Base Camp apparently due to a stroke. 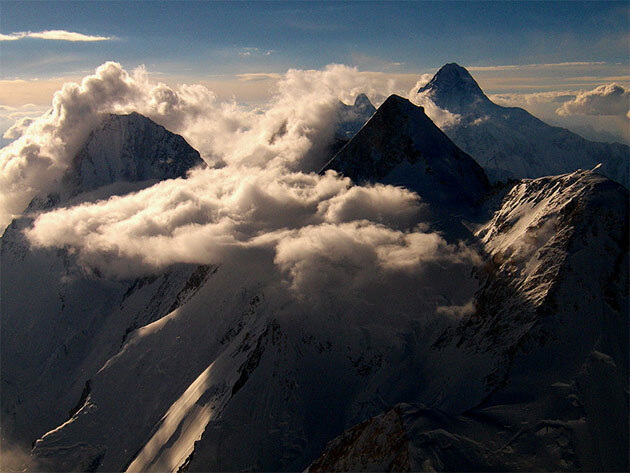 Only four people climbed Gasherbrum 2 that season: two Italians making the first ascent of the North Face (Karl Unterkircher and Daniele Bernasconi; Michele Compagnoni stopped short before the summit) and Jean Troillet together with Mike Horn following the normal route, around two weeks after I left base camp. In the end I managed to climb only Gasherbrum 1, making on the summit day a variation on the left (starting from 7500m, due to dangerous snow conditions) of the 1986 Japanese Route, in one single push from base camp to summit, making also the first Romanian ascent of the peak. No supplementary oxygen, no sherpa support. It was my second eight thousander, after Cho Oyu in 2006, and I was so happy to have been on its top. On Gasherbrum 2 I got to just 6900m and retreated in one of my most dangerous days I have ever spent on a mountain (few days later a lethal avalanche killed the two Germans). I had no regret of going back without the summit, although I wanted it so much. It was not a defeat nor a quit. You cannot really speak about conquers or defeats on a high mountain. As I use to say, for me, the success at high altitude is to come back in one piece. Summit is great if you achieve it but itis not mandatory. Your coming back alive is. So it was just a matter of time till my coming back to try again Gasherbrum 2…and here I am! I am part of a group comprising the Italian climbers Simone La Terra, Gloria Brighenti and Antonio Vicari but my climbing partner is Polish Pawel Michalski, with whom I climbed last year Gasherbrum 1. Since I did not lose all my acclimatization from Makalu yet, my plan is quite straightforward: tomorrow night (June 28th ) I climb up with Pawel an establish our Camp One at 5900m. 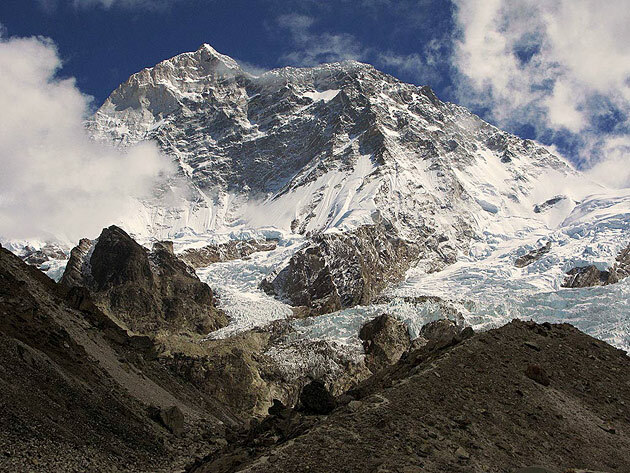 We sleep there one night and the following day I climb alone and put Camp Two at 6400m. Pawel came on June 25th so he doesn't yet have the acclimatization level to join me up the Camp Two. 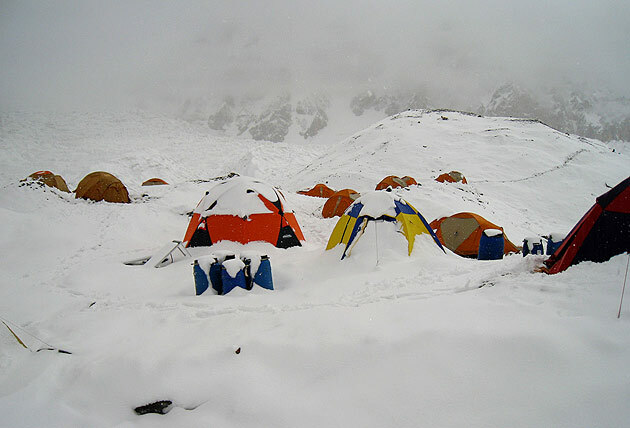 I will sleep there one night and then rejoin Pawel and come together in base camp for rest. If I feel fit and mountain conditions permitting, I will try then a fast push to the summit, making two more bivouacs at 7000m and 7400m. On my return I will let some gear up the mountain to help Pawel with his ascent. But usually the reality turns soooo different from the initial plan that minor essential J adjustments will be needed. I should have put till now camp one by myself but some nasty stomach problems kept me maybe for too long in the base camp…but envisioning myself making the last steps towards the summit gives me a confident mood. While on Makalu summit I could not help myself but think for a few moments of my friend and partner Mihnea. He deserved so much to be that day with me on the summit, at least as much as I did. 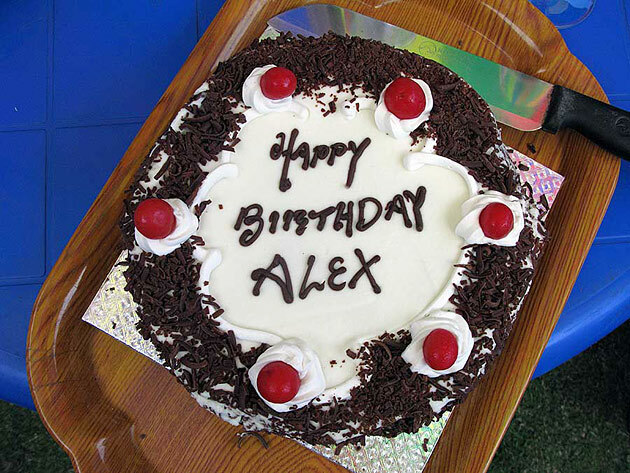 And I also know how much Mihnea wished to climb Makalu. 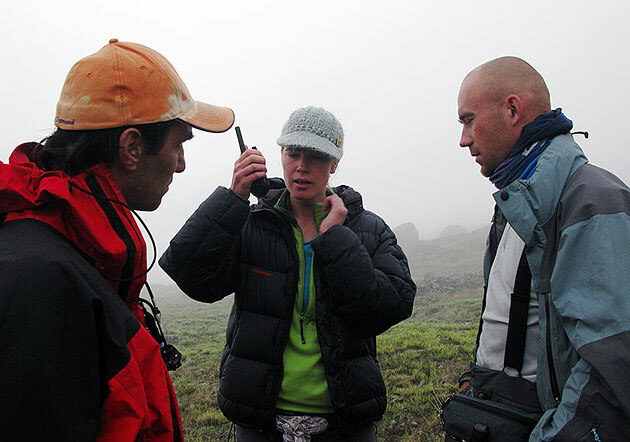 Some altitude problems kept him from climbing above 6800m and, as he is a genuine mountaineer, he decided it is better to stop for his safety and for the safety of the team. I would never forget the bear hug he gave me and the happiness in his eyes for seeing me safe and sound back in Base Camp while he and our cook and friend Kumar came on the moraine to welcome me. I want to thank you Mihnea for all your contribution and commitment to our expedition and for helping me to reach the summit. For our long talks and for your friendship. For me, you truly are the perfect partner and I am looking forward to climbing with you again. The very next day we found out that Horia and Inaki are in trouble. 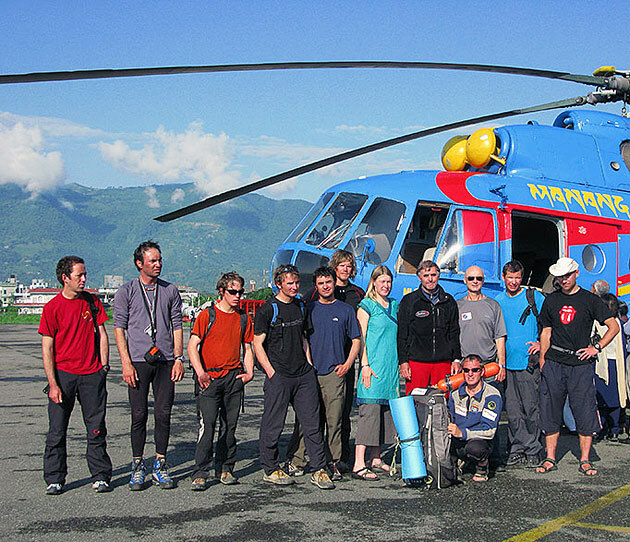 Mihnea and I took the plane to Phokara and from there the heli to Annapurna Base Camp. We didn't think too much about our decision to go, just made our rucksacs and flew. 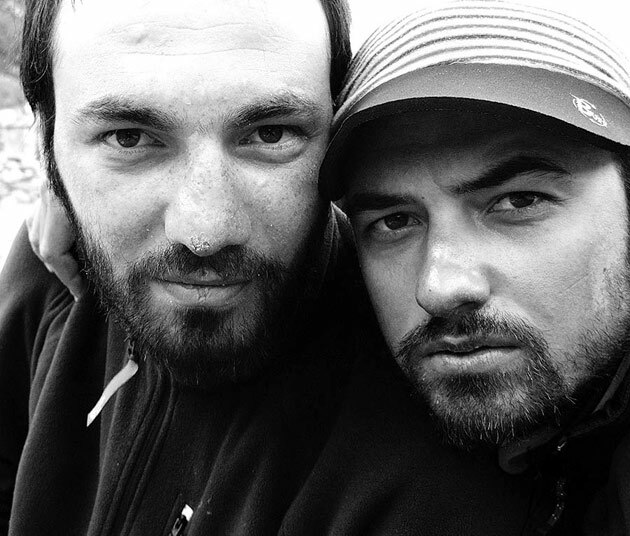 Mihnea contacted Pablo, Inaki's brother so we could join forces with the other people eager to help. 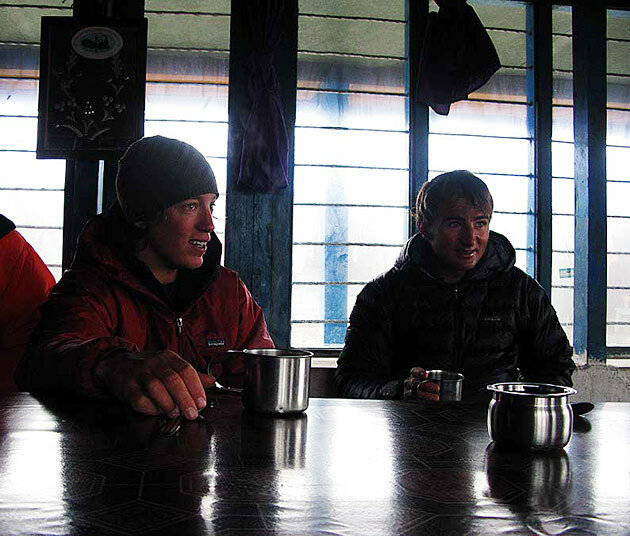 Actually a part of our gear was still to come from Makalu, so we bought new mattreses, gas and food from Phokara. I will not write here about the chronology of events, about why and how this tragedy could happen since you can just google it or you can access the links I gave on that matter on one of my previous posts. I just want to share now some personal thoughs… First of all, I personally had a very minor role in this rescue operation. Since I was just recovering after my Makalu summit without using supplementary oxygen, I had only climbed on Annapurna at 5400m when I started feeling very weak and I took the decision that it is better to return to Base Camp at 4000m rather than become one more victim and complicate the situation for everybody. Since I did not know the geography of the place (there was fog not allowing you to see three meters ahead), I kind of had an epic returning to a Base Camp whose location I knew only marginally. And did it after ten hours. 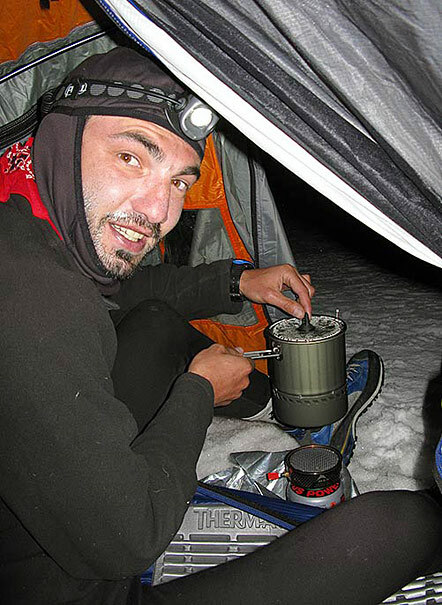 While I was finding my way over the glacier, Robert Szymczac, the Polish doctor in our rescue team ( Mihnea, Robert, Serguey Bogomolov and four Nepali Sherpas had reached in the meantime Camp Two) , sent me an sms announcing Inaki's passing away...................and all this with all the heroic efforts Horia, Ueli Steck, Denis Urubko and Don Bowie (maybe the four persons most involved in this rescue mission) put on saving Inaki's life. I also want to acknowledge the simply wonderful men who came up from nowhere (apparently only) when the signal for help was in the air. This was surely a gesture in the very true spirit of mountaineering, opposite with what happened on Everest with David Sharp or other people who kept silent over the Nangpa La shootings. I think everything which could have been done, has been done for Inaki. 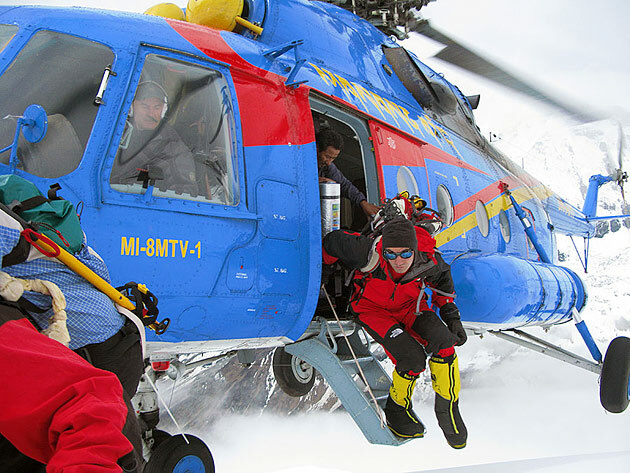 Ueli Steck and Simon Anthamatten gave up their attempt to open a new route on Annapurna South Face. Ueli was just the best person to be there and to first reach Inaki. Ueli set a new speed record on the Eiger North Face in February, scaling the peak in an incredible 2 hours, 47 minutes and 33 seconds (usually the wall is normally climbed in two, three days). So the perfect man for the job. Simon also has a record for the Eiger's north face speed ascent but this time for the team time. He and Roger Schali needed 6 hours and 50 minutes to climb from bottom to top. Simon felt bad at a certain point on the way and eventually he needed to go down. Denis Urubko, a man of incredible physical strength and modesty (13 eight thousanders under his belt, out of fourteen!!!) just fresh of summiting Makalu was carring the emergency oxygen together with Don Bowie and they were only four hours away when Inaki died. 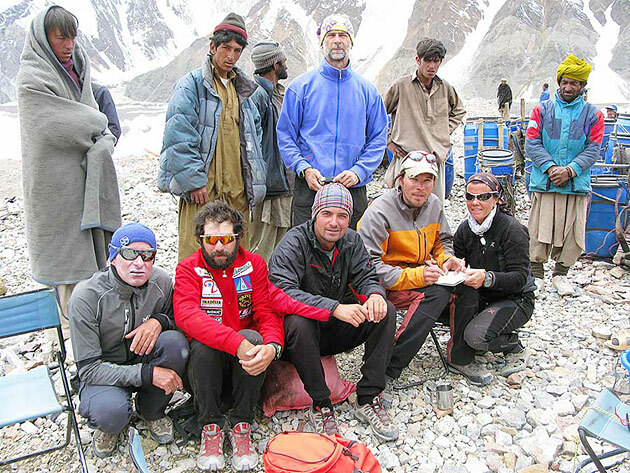 They managed to make the difficult climb in two days from near Macchapuchare Base Camp (where the heli left them due to windy weather) to just close to the spot on the exposed ridge were Inaki's tent was. 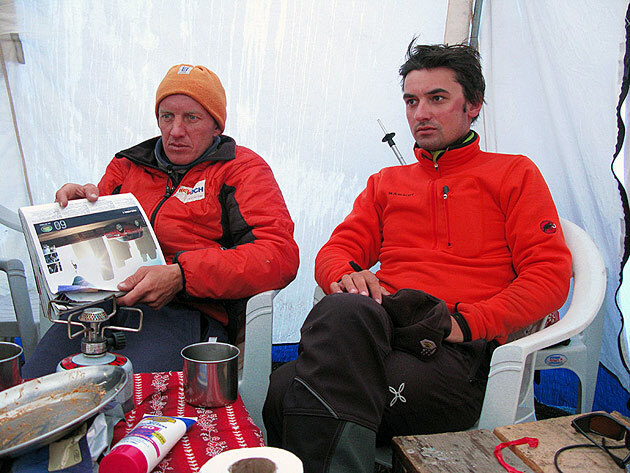 Serguey Bogomolov (twelve eight thousanders) coordinated all the action and went to Camp Two despite his frostbitten finger (luckily Serguey's finger was saved). Alexey Bolotov, the only one to make it to the summit of Annapurna this year on the same route Inaki and Horia were attempting, remained at high altitude to help despite the fact that he was also starting to have lung problems. 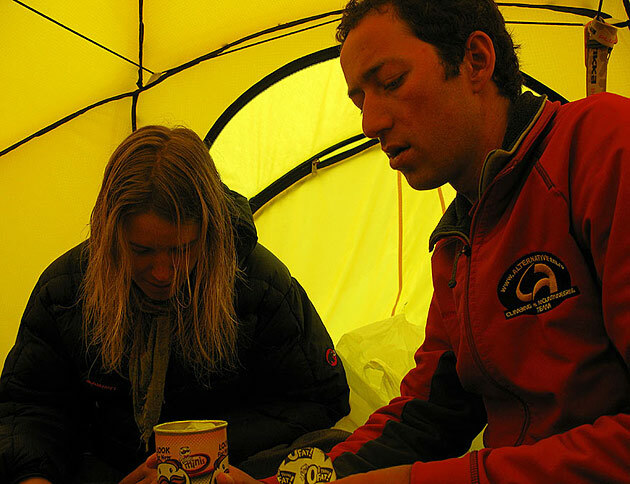 Robert Szymczac came only days after climbing Dhaulagiri with Artur Hajzer and prepared to give professional medical care in Camp Two. Mihnea went to camp two despite the fact his altitude problems might occur again (but he felt strong all along the way). The team also comprised four sherpas already acclimatized from different expeditions: Pemba Ongchu Sherpa, Ongchu Sherpa, Wangchu Sherpa and Chhiring Finjo Sherpa. 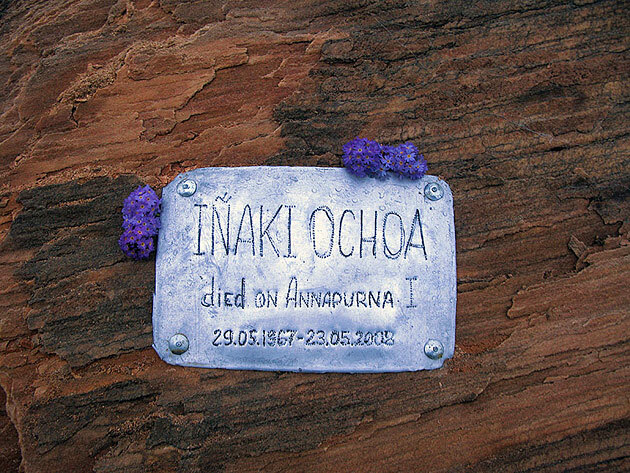 I think Inaki Ochoa was one of the most accomplished high altitude mountaineers of our time. And one of the happiest men, judging by the way he lived his life. In Horia Colibasanu's tent down in Annapurna Base Camp lied between piles of gear a hard cover book. It was Messner's "Annapurna: 50 Years of Expeditions in the Death Zone". I asked Horia the permission to have a look at the book. To my surprise, at the beginning of the book was a fresh dedication from Inaki to Horia, a part of it consisting of a Sanskrit Proverb, perfectly matching Inaki's life philosophy: " Better to live one day as a tiger than one hundred years as a sheep". Annapurna's South Face is a killer and some of the top high altitude climbers met their end there. 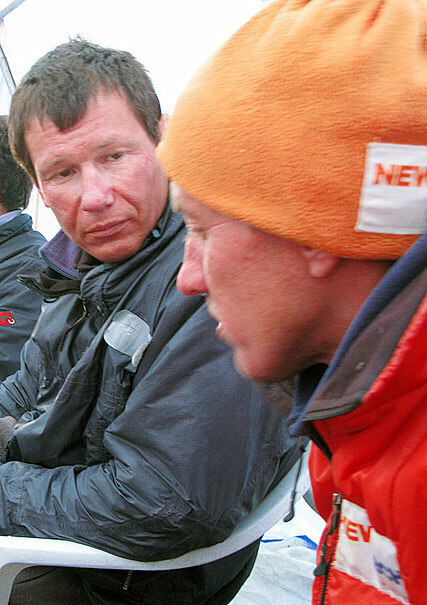 Ian Clough of Bonnington's '70s expedition, Pierre Beghin Anatoly Boukreev are just three of the most famous. Great deeds are accomplished by taking great risks. It is as simply as that. When you are striving to make the things at the level Inaki and Horia were trying to do on Annapurna's South Face, you must be well aware of the huge risks involved. And to accept full responsibility for it. These guys surely did and surely knew what they were doing. I think the main challenge of climbing eight thousand meter peaks is to keep yourself alive, or as Messner put it some time ago, " The true art of climbing is survival." Twenty days after Mihnea and myself had set the foot on Hillary Base camp at 4800m altitude, I was standing on the summit of the mighty Makalu, the Great Black, one of the "positive" obsessions of my high school years and a dream that just a couple of years ago seemed so unattainable to me and so far away, as if from another life. But one of the reasons we do live on this Earth is to continuously strive to outdo yourself and to never stop marveling. Because to keep marveling is the door to learning from the different things and experiences that we cross path with. I never had the intention or the thought (till then) of climbing one eight thousand meter peak in just twenty days since reaching the base camp. 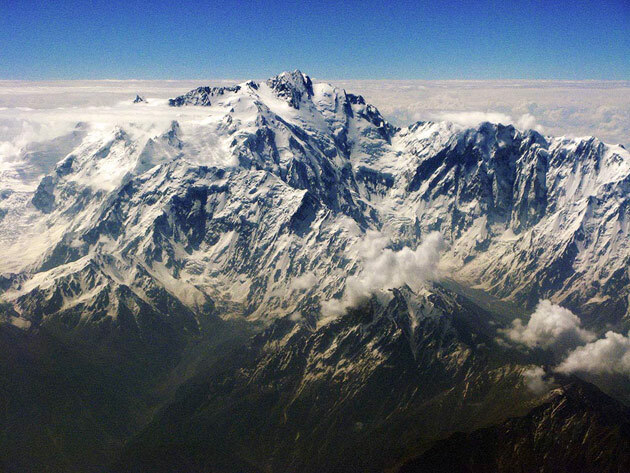 In no case the fifth highest mountain in the world with its 8463m height. I think this is quite suicidal from many points of view. But I believe one of my strong points is the capacity of envisioning things or actions at the very limit of what is possible ( or a bit over that limit ) and to create there a space of possibility in which I can safely deal with the risk set at a level I find acceptable. In my summit push my brain divided the whole time into two: one part was monitoring my body and the other was permanently connected with the mountain. Each second weighting on the assertion "you go up or you go down". Each moment prepared. And it was the same brain I was asking to think objectively at an elevation where the aircraft pilots are flying in pressurized cabins. In my most optimistic forecast, given the fact that absolutely everything would go smoothly (which at high altitude actually never does), my closest summit date should have been May 23rd and the realistic one somewhere close to May 30th. The plan was to establish our Camp Three in Malau La at a height of 7400m, sleep one night there for acclimatization and descend the following day. We had only three days to rest in Advanced Base Camp at 5600m when Mihnea and myself went to Camp Two with the intention to make it to Makalu La. There Mihnea did not feel at his best and decided it's better for him to go down. All the way to Makalu La an apparently crazy idea begun to grow and grow in my mind and to develop in a whole mind map with pros, cons, concequences, strategies, etc. ….WHAT IF…WHAT IF…I will try the summit this time? I was very aware of the fact that I was not fully acclimatized and my success or failure will depend of three critical key factors: the first was for me to be in perfect physical condition once reaching Makalu La and later on, while reaching the spot of Camp Four, the place of my high bivouac at 7800m (I never slept so high before); the second factor was my speed and my ability to "cheat" my body by climbing fast enough and descending fast enough in order for it not to really realize the height of the ascent while I was there; and the third factor, equally important, was the weather; if bad weather would have occurred on my descend from the summit and trapped my in my tent at 7800m, I would have just got myself in a big huge trouble, because my body would have started to feel my lack of acclimatization and within short time I would have developed pulmonary or cerebral edema, or both. And this would have been a close call. I reached Makalu La early in the evening witnessing a magnificent sunset over Everest and Lhotse, one of the views that will always remain deeply etched on my soul and which I can recreate in my mind every time I will need a sudden influx of energy. The next day I felt very fit and powerful and continued through the spot of Camp Four, a tiny and exposed spot to accommodate only two tents. 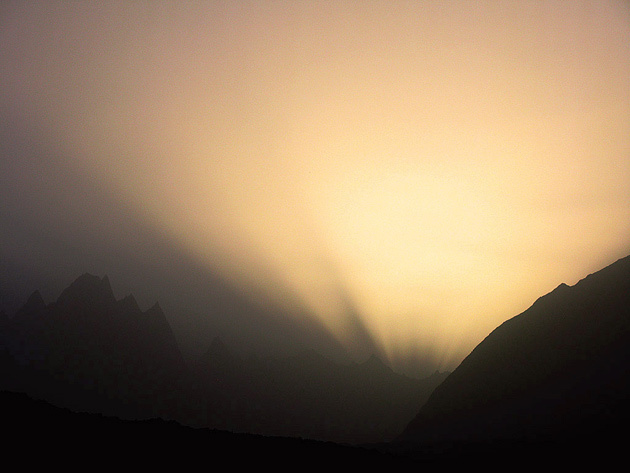 I left the tent at 7800m at around three in the morning. It was cold. Damn cold. Too cold (actually a lot of people got severe frostbite this season on Makalu). Some of the most difficult sections in the upper part and on the mixed ground have been fixed by the British team that summited first. Not the couloir. I reached the summit at around 2 pm, Pakistani time, almost one hour after Denis Urubko and his three mates (which I encountered on their descent from the foresummit). I was astound but felt no headache, only deep tiredness. But strangely strong. Still, on my summit video I am saying " May 10th 2007", instead of " May 12th 2008". At that altitude you're stoned even if you don't admit it . Makalu might be "one of the hardest proposition of all" (Sir Edmund Hillary) but for me, while I was up there in the summit push, was the right amount of humility mixed with perfect timing, endless and long hours of training and pain that paid off, strong faith in myself…and luck (and you always need a certain among of luck while up into the "Death Zone"); and of course, it was the little wooden seahorse I always had upon myself since leaving Romania. Now it lies deeply buried in the summit frozen snow, watching over the lucky summiteers. And with it there, also lies a part of my soul. Much too often we forget who we are. 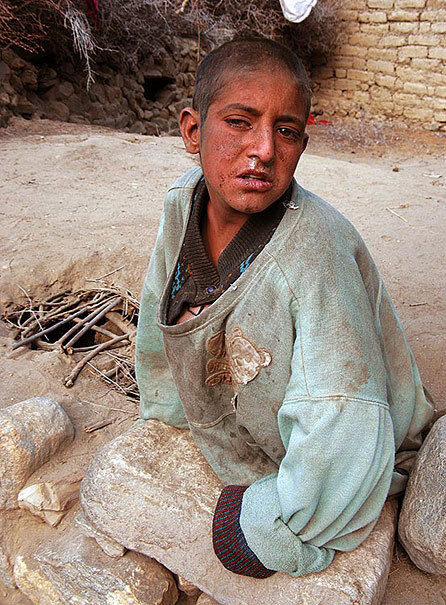 Summit, Success, Life, Love…I am a human and each and every day I confront my humanity.